Louie the Fish not only catches bonefish in those oh-so-difficult bonefish hunting ground of Hawaii. Louie has been at it a while and he also does some pretty outstanding fish carvings. Louie agreed to do a little interview for Bonefish on the Brain. Louie, can you tell me about a particularly memorable fish? I have so many fish that stand out in my memory, from my first 6 inch native brook trout in Connecticut at about 10 years old, right up to great catches 50 years later. 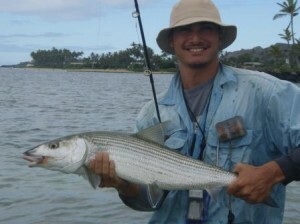 Here in Hawaii I have been a bonefish fanatic for about 10 years. I got my first taste of what this amazing fish can do while on holiday in the Florida Keys. I was wading around behind a friend’s house on the gulf side of Islamorada. Bonefish were everywhere, right at my feet, and they all had lockjaw. I tried every fly in my box! Finally, in frustration, I decided to tie on a big green wooly bugger with palmered red hackle, and I waded out to the edge of the marl, and began blind casting, stripping it back, cast after long cast. Like a cannon going off, I got a strike, that within a millisecond ended suddenly in a balled up mess of line, and a big break off. I was clever enough to repeat the whole fiasco a few minutes later….smoked by my first encounter with bonefish! But that experience was prophetic. A few years later I began fishing here in Honolulu, and doing what most bonefishers do, stalking bones in an attempt to catch them sight fishing. Three weeks went by fishless, and then a light went on in my brain. I remembered that blind casting got me my first bonefish bites, so I became a dedicated blind caster. I discovered many hot spots, and began catching many big bonefish. 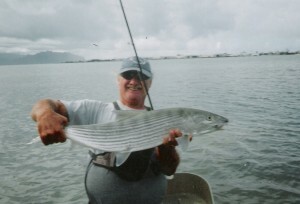 I even wrote articles about it, and word got out, and I found myself guiding anglers for bonefish. I had it down to a science, where to fish, how to cast and how to retrieve, and designed special weedless flies meant for blind casting. Joaquin, Louie's son and a guide, with another monster blind casting bone. Of course like all want-to-be purists, I still leaned toward sight fishing, and when conditions were good, I did that as well. This is all leading up to my story about my most memorable bonefish. One day I was on a flat we called Ross’s flat, since friend and fly fisher Ross had recently landed a 37 inch bonefish, estimated at about 18 pounds, an easy IGFA record, had he not released it. It was late afternoon, the easterly wind was strong, and the sun was in the west. I was wading slowly upwind, since I could only spot fish in that direction. I had many, many shots, but it was hard to cast into the wind, and I spooked bonefish after bonefish. I finally got to the top of a long stretch, and decided to turn around. Downwind it was all glare, so I couldn’t see fish, but it was easy to make long casts. The water was only about knee deep, so I put on a lightly weighted fly, my Leeezardfish fly. Three casts later, a small thump was followed by a run which gradually increased in speed and distance, until that bonefish was out of sight almost, and had almost reached the distant, coral lined reef edge. Well several shorter runs later, and I slipped a hand under a 32 inch, very fat bonefish, maybe 13 or 14 pounds. The battle had attracted Ross, who had a camera that got this shot, before I released my biggest, and most memorable bonefish, made even more memorable, because blind casting had succeeded where sight fishing had not!. This was just one of many double figure bonefish I have landed here blind casting. Of course by now I have landed almost as many sight fishing, but when conditions demand a change, go with the conditions! I'm pretty sure that's a whale (actually, it is the fish from the story). 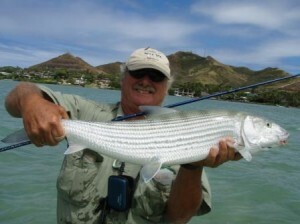 If you happen to come here to try your hand at our elusive bonefish, stop in at Hawaii’s only fly shop, Nervous Water Hawaii, and those guys, Sean and Clay, who have fly fished for bones here all their lives, will readily attest to the fact, that in Hawaii, due to the nature of our reef flats and prevailing conditions, bonefish are most easily caught blind casting. Well… blind casting… who knew? 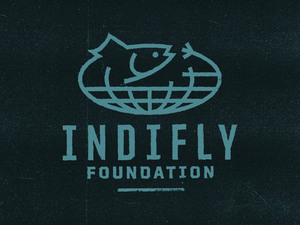 This entry was posted on Tuesday, May 25th, 2010 at 3:30 am	and is filed under Fish Tails, Locations. You can follow any comments to this entry through the RSS 2.0 feed. You can leave a comment, or trackback from your own site.